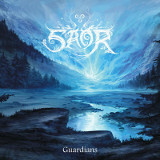 Two years after we reviewed Saor's promising post-Àrsaidh debut, Aura, they're back with a new full-length, Guardians. It's a further departure from traditional black metal in several ways, with even more reliance on Andy Marshall's soundtrack-quality instrumental backing, but if anything, this actually makes it better than Aura. This is no dewy-eyed New Age emo masquerading as metal; it's a Scottish movie soundtrack where black metal is one of the many instruments used. The first thing heard by the listener isn't guitars, it's bagpipes, followed closely by violins. But the wistful quality of the music and the fantastic production is enough to hold interest, long enough for the guitars and drums to kick in. Like the previous album, short songs simply aren't done; not one song under ten minutes in the lot. The guitar tremolo-picks several of the tracks, which primarily adds flavor to the fiddles, an almost constant background in the lot; on Declaration, the transition between violins and electric guitar soloing is near-seamless. Marshall's happy to do plenty of clean picking too, which gets more room at the front of the mix the softer it is, but there's room for thunderous blackened passages as well, when the soundtrack permits it. In Scotland, there are apparently plenty of Braveheart-style battles as well as romantic idylls on the moor. Battles or peaceful scenes, however, nothing can crush the music's relentlessly uplifting nature; it's done very subtly, nothing even slightly grating, but if you want dark introspection, find another band. The one weak point I see in Guardians is Marshall's vocals on this one. If everything wasn't so finely produced, it would be less noticable, but his singing never matches his guitar chops or production abilities, giving him a hollow rasp of a voice that sounds like he'd rather be singing clean, and is only singing harshly because it's supposed to be a black metal album. Come to think of it, he does sing clean on Hearth, and it sounds quite good. But it doesn't matter much; vocal passages are short, few, and far between, and the guitar and drums do most of the talking on the metal front. Autumn Rain, one of the more traditionally black-metal-oriented songs of the lot, is a prime example -- sure, there's a bit of sub-par singing, but as if to cover for it, tiny but intricate clean guitar riffs jump in right after the vocals, and they're so skillful, and the vocals so unmemorable, that it is very likely the listener will forget all about the vocals and move on to more of the good stuff. Guardians shows substantial improvement over its predecessor, which was already a very good album in its own right. The soundtracks are grander and more vast, the mix of black metal with folk sentimentality is done more gracefully, and the cultural and nationalistic fervor of the lyrics (cribbed freely from famous Scottish poets, and remixed with Marshall's own lyrics) sounds genuine. All in all a strong followup.